Arty-morbid 'delights', if you please. Too much stuck in the symbolic and orderly, but one would certainly want to watch it for getting the pleasure of pure symmetry. May water wash your sins. As beautiful and mesmerising as much as it is idiosyncratic and bewildering. Bernard Hill really was great in this; full of presence and poise. Greenaway's visual style and use of music are right up my street and "Drowning by Numbers" had me transfixed from start to finish. 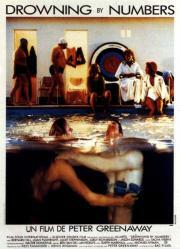 I wonder how many times Wes Anderson watched this film? And it goes; 1, 2, 3- What the hell are we looking for? And then; 5, 12, 65... This movie is begging for at least (insert number) rewatch(es) or some serious sudoku skills. In all regards, it's a beautiful, painteresque picture which, unfortunately, lacks the motivated storytelling to make it a riveting experience. Aside from the aesthetics, the film also provides absurd, often humorous, situations which plot-driven ventures would never bother with. The Gravedigger's cameo is hilarious. "Once you've counted a hundred, all the other hundreds are the same." Greenaway's style and the way he constructs his shots is right up my alley. The composition of each shot is so particular and methodical, it gives his films the appearance of a painting in motion. Drowning By Numbers is visually arresting, and has a quirky and complex narrative that gives it a grotesque charm. First hour is hit-and-miss, second is perfect. maybe its because I don't believe anything can standup to Greenaway's The Cook, The Thief, His Wife, and Her Lover, but I found DbN to be flat in terms of its story. Beautiful imagery and setting as usual, though. maybe I'll have to give it another try. I guess I have no proper score or words to estimate this one. At times it is funny and interesting, sometimes it is intriguing and involving. Greenaway has a rich aesthetic charm and imaginative view but I am not going, definitely, to re-watch it again, even for the sake of detecting all of the numbers in the movie.